Courtesy EA Sports: On Monday the 14th, the demo for NCAA Football 11 was released on Xbox Live and the Playstation Marketplace, and so far the impressions have been overwhelmingly positive. But some are wondering, is the Demo truly NCAA Football 11? It came out a month before the game is due to hit shelves, so does that mean we put another month of work into the game after that? Yes it does! As a matter of fact, we finished the demo on the 1st of May and finished the game on the 1st of June. In this blog I will address some of the differences between the demo and the final product. 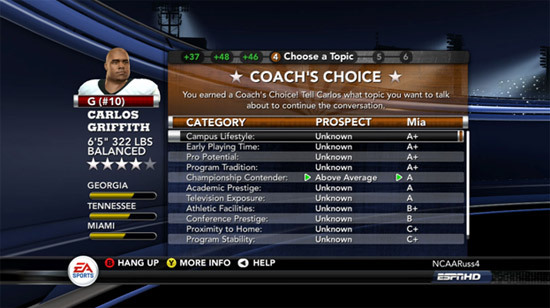 While at E3 in Los Angles, PastaPadre has compiled the team ratings from NCAA Football 11. As of this post, the first 8 teams are missing. We will add them in if/when available. MadScientist06 of MaddenMatrix.com has posted a video of all team ratings. He adds: Team ratings could change by the time the game goes Gold. UPDATE - PastaPadre has posted team offensive styles for the majority of the teams in the game. 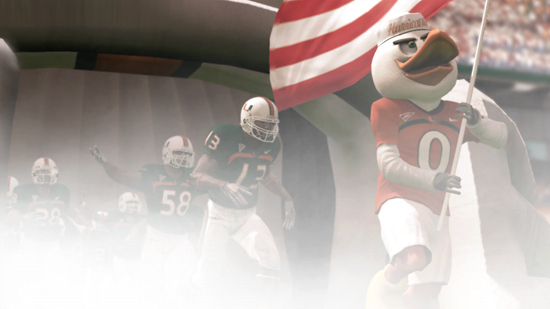 XBox360Achievements.com has posted the full list of Achievements for NCAA Football 11. There are 50 Achievements worth 1,000 points. It is expected that this list is the same for Trophies on the PlayStation 3. - Point Some Fingers (20) - In a single phone call, take 250 points away from one school by downplaying pitches. - Options (25) - Score 35+ points in a game running an Option offense (excludes co-op). - One Hit Wonder (25) - Get an instant commit from a prospect by offering a scholarship on a one topic call. - Switcheroo (20) - Secure a commitment from a prospect that was a soft commit elsewhere. 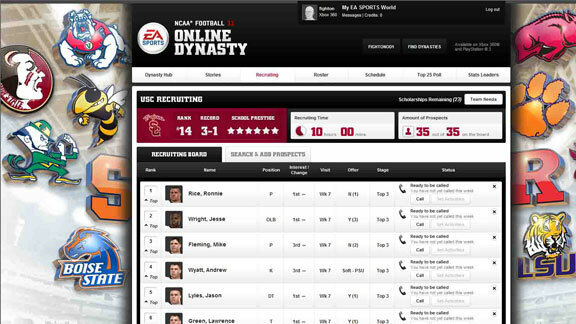 EA Sports has posted a first look at the new phone call system coming to recruiting in NCAA Football 11's Dynasty Mode. In this video, EA SPORTS Live Team member Andrew Johnson learns how to use the phone call from designer Ben Haumiller. Tuesday afternoon, it appeared that the TeamBuilder website had been updated for NCAA Football 11. However, designer Adam Thompson has passed on the word that the site was not complete and not meant to be live. While he expects teams made on this partially updated site to work on NCAA Football 11, he and the team cannot guarantee it. Another NCAA Football 11 blog has been posted, this one by Designer Ben Haumiller discussing Dynasty Wire. Pull up a chair; I want to tell you a story. - Well, E3 is here, and if you haven't downloaded the demo yet, what are you waiting for? Now that we've got that out of the way I want to go in depth on the new Dynasty Wire and StoryBuilder features that were recently announced. We've got another blog in the works to talk about everything you can do on the new Dynasty website (dynasty.easports.com), but there's so much to talk about we wanted to split these up into two parts. Over the next few days, media outlets and gaming sites will begin posting their thoughts, coverage, and impressions of NCAA Football 11 while at E3 in Los Angeles. To help manage all of these reports, previews, and video, this is your one-stop location for all game related info. The newest information will be posted at top, so keep checking The Gaming Tailgate throughout E3. 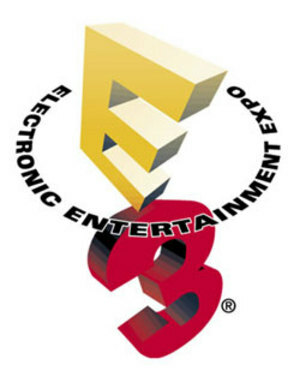 For more E3 and video game information, visit our Other Video Games forum. The most important screen in the game without a doubt is the play call screen. This is where you need to make quick strategic decisions. It is of the utmost importance that everything is available to you quickly and easily; especially when going up against an up tempo, no-huddle offense. With that in mind we determined that the play call screen needed to be streamlined for NCAA Football 11. A lot of the Play Call features I'll be talking about have been in previous versions of the game, our goal wasn't to blow everything up and start from scratch, however, we wanted to make it feel as if all of your playbook options were always at your fingertips. In this blog, we will go into those updates as well as talk about the crucial role the NCAA community members had in shaping the final version of the screen. The NCAA Football 11 demo is currently available on X-Box Live and the PlayStation Network. The demo features four match-ups playable in four two-minute quarters. The match-ups include Missouri vs. Clemson, Miami vs. Ohio State, Florida vs. Florida State, and Oklahoma vs. Texas. Playing each match-up as well as sharing word of the demo with friends will unlock selectable Nike Pro Combat uniforms for use in the full retail version of the game. Monday afternoon, EA showcased their 2010 line-up of games crossing all platforms and game genres. Among the games highlighted at the E3 media briefing: Bulletstorm, Crysis 2, Dead Space 2, EA SPORTS Active 2, EA SPORTS MMA, Madden NFL 11, Medal of Honor, NBA ELITE 11, and more. To view the live stream of the event, click here. Monday’s NCAA Football 11 demo gives gamers the ability to unlock the Nike Pro Combat uniforms for all eleven teams that wore them in the 2009-10 season. Fans of Ohio State, Miami, Missouri, and more have been asking for months if Pro Combats would be in this July’s game. Why the hype? What is so special about them? Let’s take a look at the Nike Pro Combat uniform and try to understand the phenomenon. The fourth and final match-up for next week's NCAA Football 11 demo has been announced and it will be the Red River Rivalry, Oklahoma vs. Texas. Oklahoma's Nike Pro Combat uniforms are now confirmed for the game. The other match-ups in the demo include: Miami vs. Ohio State, Florida vs. Florida State, and Missouri vs. Clemson. Expect more details on the demo leading up to its release next week, coinciding with E3 in Los Angeles. 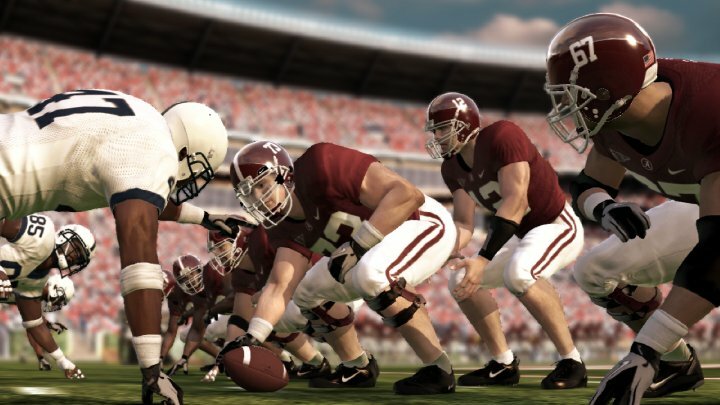 With "NCAA Football 09", EA Sports introduced football fans to their version of an online dynasty where gamers were able to play in a conference with up to 12 players, but managing your school had to be done through the console. This year, the team behind "NCAA Football 11" is finally taking the feature full-force to the Web, enabling gamers to log onto their dynasty anywhere they have access to the Internet, whether it's on a computer, iPhone, or even an iPad. That's right, now if you an extra 20 minutes to kill at work (or if you just don't feel like working), you can log onto your team online, schedule a game, try to recruit that strong-armed quarterback for next season, and even write up a news story about how you destroyed Florida the night before and post the story to Facebook. The second of four playable match-ups available in next week's NCAA Football 11 demo has been revealed - Florida vs. Florida State. Several screenshots of this match-up have been posted in the NCAA Football Facebook product page and they confirm that FSU's Nike Pro Combat uniforms will be in the game. Florida State vs. Florida joins Miami vs. Ohio State as the two announced demo match-ups. Expect the next two pairings to be announced Wednesday and Thursday. 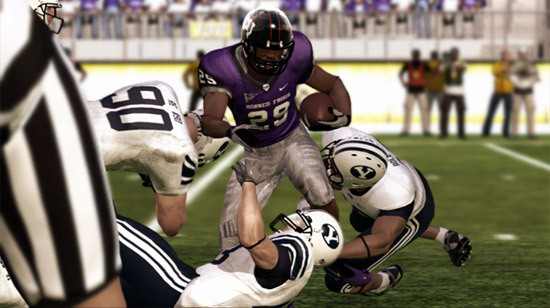 The third blog covering improvements and changes to Dynasty Mode in NCAA Football 11 has been posted. Composed by developer Russ Kiniry, the blog covers Recruiting Logic and Extras. 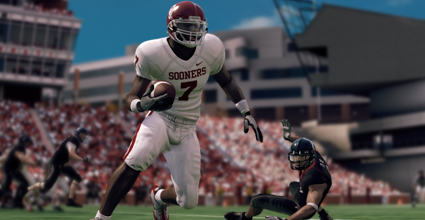 EA Sports has just posted six new screen shots to their NCAA Football Facebook page. 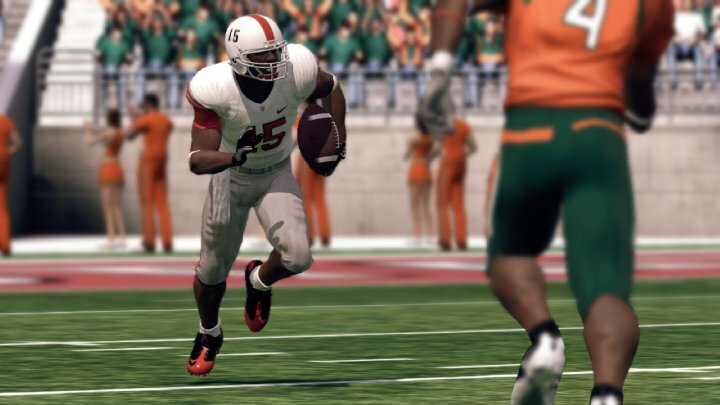 These shots were taken from the demo in a matchup featuring Ohio State Buckeyes versus Miami Hurricanes. In the screenshots, we get a look at the Ohio State Pro Combat uniforms. Additionally, EA added this comment: "Screens for the demo have been posted. Stay tuned all week for more updates regarding the demo that is released a week from today, 6/14!"